Two seasons removed from a triumphant Super Bowl 50, the Denver Broncos have hopes of a rebound season after last year’s 5-11 debacle. Both sides of the ball are littered with young players with the potential to post their best seasons to date. Nearing Denver’s season opener against the Seattle Seahawks on Sept. 9, here are five Broncos who could breakout in 2018. The Broncos showed the trust they have in Simmons prior to last season in cutting T.J. Ward to free up a starting spot for the young safety. After starting 13 games as a second-year player, Simmons is poised to add another dimension to Denver’s No Fly Zone. In those 13 games last season, Simmons totaled 68 tackles, two interceptions and five pass breakups. This came on the heels of a rookie season when Simmons notched two interceptions and started three games. The 6-foot-2, 210-pound safety has the physicality to play in the box and stop the run, as well as the athleticism to excel in deep-pass coverage. Simmons – who has missed three games in each of his first two seasons – is fully recovered from an ankle injury that ended his season in Week 14. 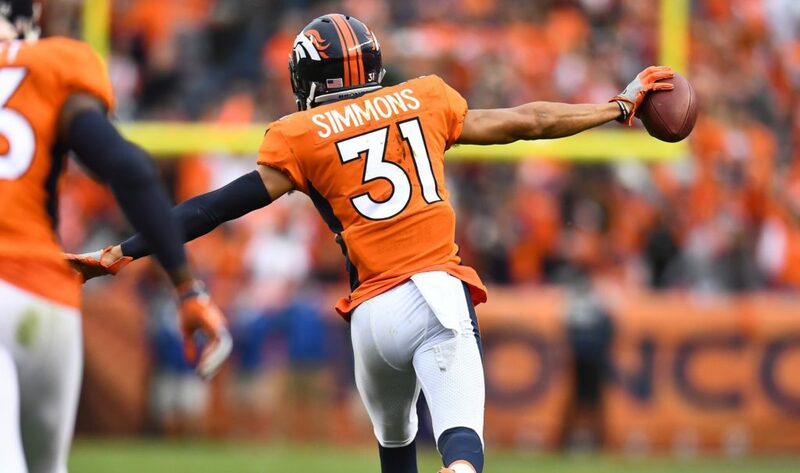 If he avoids injury, Simmons can become a dangerous playmaker in Denver’s secondary. Another third-year player, McGovern finds himself as the Broncos’ starting right guard this season. A fifth-round pick in 2016, McGovern started the final five games of last season after failing to find the field his rookie year. His performance will be one of the most integral on an offensive line looking to find consistency on an ever-revolving front five. With veterans Ronald Leary and Jared Veldheer playing along the line with him, McGovern could solidify himself as another promising, young offensive lineman. McGovern’s strength has never been in question, notching 33 reps on the bench press at the combine and owning the majority of the Missouri’s records in the weight room. He translated that onto the field this preseason and has a clear opportunity to anchor the right guard position this year. Aqib Talib’s offseason departure opened the door for Roby to slide into a starting role alongside Chris Harris in 2018. In four years as the Broncos’ third cornerback, Roby accumulated 186 combined tackles, six interceptions – two returned for touchdowns – and five forced fumbles. Last season, Roby advanced further in his career by leading the NFL with a 17.4 percent contested catch rate. He’s already proven himself as nickelback, causing reason to believe he could become a Prow Bowl-caliber player as a full-time starter this year. In a contract year, Roby figures to continue the upward trajectory of his career and cement himself as a leader of Denver’s defense. Vance Joseph finally named Freeman the starting running back this week, removing all obstacles between him and a dominant rookie campaign. Playing behind Devontae Booker this preseason, Freeman amassed 84 yards on 15 carries – an average of 5.6 yards per carry – and three scores. The 6-foot, 238-pound Oregon product flashed strength, speed and vision on multiple 20-yard touchdown runs and finished as one of the best backs of the preseason. The prevalence of successful rookie running backs has increased in the last few seasons, and Freeman has all the tools to be among this year’s best. The Broncos proved Davis’ worth to the defense by signing him to a three-year, $15 million contract this offseason. In the last two years, Davis has been one of the most underappreciated players on a defense laden with talent. Davis led the Broncos in tackles in 2016 and earned recognition from PFF as one of the Broncos’ best run-stoppers. Now a captain of the Broncos’ defense, Davis can produce his best season yet at one of the most demanding positions on the field.